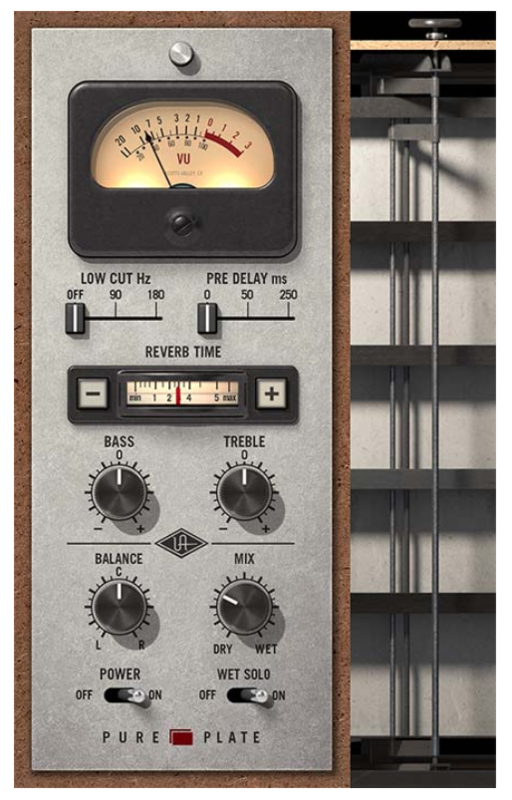 Universal Audio has been recreating incredibly realistic emulations of some of the best hardware equipment that gets used on all the best recordings we love, giving music creators amazing tools for recording, mixing and mastering. As Universal Audio is running a fantastic Vocal Plug-in promotion with their Apollo Twin Audio Interfaces, I wanted to share with you some of the plug-ins I use all the time or my go-to choice for specific tasks. The Manley Voxbox is possibly the ultimate vocal channel strip with a high-fidelity valve mic preamp, optical compressor, Pultec-style EQ, de-esser/Limiter. I reviewed this plugin when it was released, and you can read my thoughts in the UAD Manley VoxBox Review. I love distortion on vocals (I grew up listening to Butch Vig’s productions and metal), but as I get older, I find myself using it less and less as an effect and more and more as an enhancer. The UAD Thermionic Culture Vulture is the best-sounding distortion plug-in I have in my arsenal and is my go-to distortion processor for almost anything from drums, guitars, synths, vocals even a buss. In small dose it has a great ability to add presence and gravitas, helping any source I put through it cut through in a mix. Its classy distortion is particularly well suited for vocals in my opinion especially in triode mode where it adds a pleasant sheen, weight and presence effortlessly. For a more aggressive sound, it’s capable of adding a lot of grit yet remain very musical. In such situations, however, like the original hardware, the bass can get lost and use the Mix knob (not found on the original unit) if necessary to dial some of it back. For these extreme settings, I tend to like the high-cut filters as well which removes some of the harshness caused by the distortion. There is so much that you can do with the Thermionic Culture Vulture and not just on vocals, I find it invaluable in my arsenal. There is something magic about plate reverbs, and while I will never have enough room ever to own one, UAD’s emulations are spot-on. I usually go to the fully fledged UAD EMT140 Plate Reverb for vocals. The natural sheen of plate reverbs, really lends itself to vocals adding depth and clarity. On heavy mixes or for people working with a simple UAD-2 Apollo Twin Solo or Duo, the UAD Pure Plate Reverb (which is included in Universal Audio’s Apollo Twin Vocal promotion), is a great alternative, adding many of the benefits of the EMT140 without as much DSP requirement. Its simple interface and controls also make it ideal to dial in the perfect reverb for tracking quickly, giving vocalists, a rich and pleasant sound back in their monitoring all latency-free. This unique delay is a surprisingly versatile unit with a truly unique tone. The hardware unit initially designed by Universal Audio founder Bill Putnam in collaboration with Duane H Cooper, used a garden hose as the delay element. The reason, I like this unit, in addition to its unique sound, is how versatile it is. Capable of producing very short delay, the Cooper Time Cube can be used as a doubler adding width to vocals, making them sound fat and help them sit perfectly in the mix. It’s also great for the more traditional use of delays with a grainy sound that adds a tremendous amount of character. The provided presets are great at showcasing the strength of this unit, and while its interface is relatively easy to understand, the possibilities offered by this unit are not necessarily obvious for people not familiar with the original unit or with mixing background. Play with the presets, however, and you’ll understand how powerful this little unit is. Whether you are producing rock or EDM, the Cooper Time Cube is an incredible asset to have, not just on vocals, but on guitars, synths and much more. Auto-Tune… one of the most contentious vocal inventions ever made. I have to admit this is not something I go to for my productions, the singer I work with hates that sound, and I’m not a fan myself. On the other hand, I am often involved in projects where the artist is looking to get “that sound” and I’m pleased to oblige especially with the UAD Antares Auto-Tune Realtime which lets me track an artist through it with no latency. In this context, the artist can play with his voice to modulate the tuning and immediately hear how it affects the result. Sometimes, some songs require the “smooth” sound it provides to gel better with the rest of song or I even discreetly add it on a double-tracked vocal to give it the professional polish we’ve become accustomed to without affecting the main vocals. The interface can seem daunting, especially to the casual user but that’s because it offers a considerable amount of control to suit your requirements. Start with the presets, which are all great and explore the capabilities of the interface. Spend some time understanding the different sections, and you’ll be rewarded with a potent and flexible unit. One feature I particularly like is the ability to use a MIDI keyboard or controller with it and use to control the pitch and some of the features. 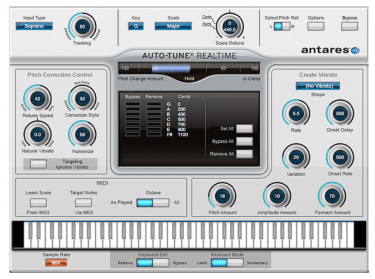 It lets you, for example, play the target note for Auto-tune to correct to or allow Auto-tune find the scale based on the keys played on the keyboard. Another worthy mention for vocalists (but not only) is the UAD Ocean Way Microphone Collection. A microphone emulation plug-in that works with the Townsend Labs L22 microphone that gives you accurate modelling of Ocean Way Recording's highly sought-after mic locker including the legendary U47, AKG C12 (two different versions), Neumann M 49, M269, Sony C800G, M50, KM53, KM54, Sony C55P, RCA KU-3A and Shure SM57 Unidyne III. This locker delivers an incredible range of tones to suit a whole range of singers and genres. It also works wonders on tracking instruments giving the tools of one of the best recording studio in the world all on your computer. So here’s our favourite plug-ins for tracking/mixing vocals. I didn’t include processors such as EQ or compressors as both are included in the Manley VoxBox, but also because I feel this is part of a broader conversation about mixing in general and will be part of another article in the future. Let us know your favourite UAD plug-ins for recording/mixing vocals if you already own some or tell us what you think of our selection; we’d love to hear from you. If you’re starting recording vocals and looking for an interface or “vocal chain” Universal Audio are running a great offer on the Apollo Twin audio interface including three of the plug-ins mentioned in this article. We’re also offering super prices Universal Audio Custom Bundles giving additional plug-ins at the best possible price when you buy an Apollo Audio interface or UAD-2 DSP Accelerators system.